I bought LHO for the yield. My basis is $33.45 above the $28.94 where LHO trades today. Current yield is 7.22%. Yield on my basis is 5.38%. Look at this dividend growth chart. This is the kind of dividend growth that makes an income investor salivate. As soon as I bought LHO for both the yield and the dividend growth, they stopped the dividend growth. Suspension of a dividend is devastating but holding the dividend steady is acceptable. This holding of the dividend is a result of reduced income which in the hotel industry is called "rev par" or revenue per available room. Some of this is due to increased competition from a growing supply of upscale properties. Some is due to their Key West Florida property damage from Hurricane Irma. LHO is investing in their properties as they take on the competition. During renovations, rev par can be affected negatively on a short term basis. Will the renovations stimulate rev par in the future? I can live with the over 5% yield on my basis while there are few options to obtain that yield elsewhere. Moreover, I don't think the company is in jeopardy of going belly up. D/E (debt to equity ratio) is .447 (source ycharts.) Strength of the balance sheet allows me to continue to hold. Pebblebrook, symbol PEB, another REIT in this space, has made an offer for LHO at about $30 a share. LHO rejected the buyout offer and for me I am happy about that as I would like to get back my basis. Perhaps, PEB will up their offer or perhaps another acquirer will show up. 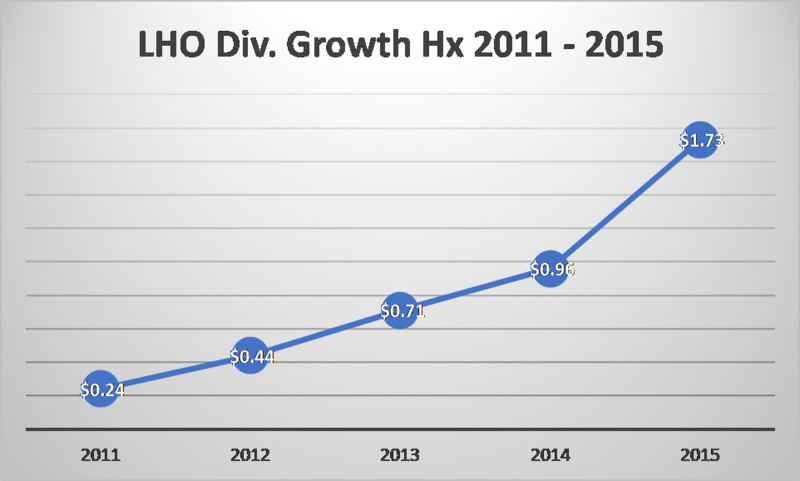 Or maybe LHO will stay independent and return to Rev Par growth that will feed dividend growth. This is one holding I will watch carefully. I am not interested in PEB with a yield of 4.53% and a much higher P/E ratio than LHO (PEB = 29 and LHO = 18.) PEB also does not have particularly impressive revenue growth. Clearly, in this case, dividend history was no predictor of future dividend growth. With a solid balance sheet, risk is not huge, but I am underwater and will hope for a more robust buyout offer. At least it is some encouraging news.